Chartered on March 6, 1960 by the then current Far Western Regional Director, Lucille B. Bryant. Celebrating 50 years since our chartering in 1960. Eta Lambda Omega has a lot of history and a proud culture. Through the years, Eta Lambda Omega has seen many changes. We have worked to make a difference in our community and help it to be better because of AKA's involvement. The chapter was an adjunct of Alpha Gamma Omega, a graduate chapter located in Los Angeles, California. The chapter was chartered with thirty-two members in Pasadena, California. Since Eta Lambda Omega was chartered, several of its members have held various positions in the national offices of Alpha Kappa Alpha Sorority, Incorporated. These women include: Soror Gladys Pullam, past Recording Secretary and Treasurer, Soror Mildred Robinson, a charter member of Eta Lambda Omega chapter, and our Past Far Western Regional Director, Soror Francine O. Greer, former President of Eta Lambda Omega chapter, and also past Recording Secretary for the national office of Alpha Kappa Alpha Sorority, Incorporated. Health Summit 2010 Deemed An Overwhelming Success! 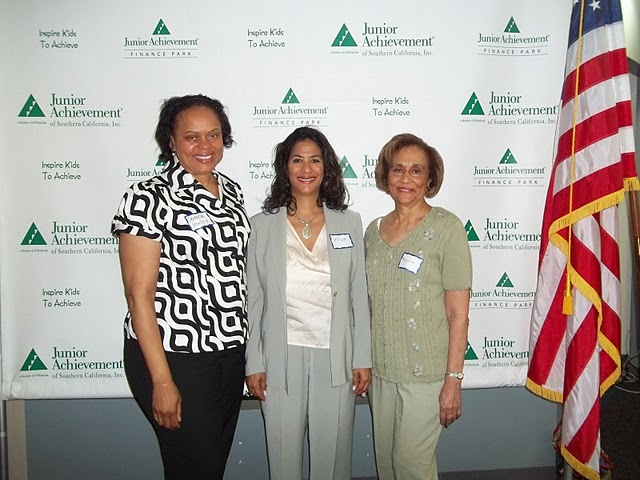 On Saturday, September 25, 2010, the Pasadena Chapter of Alpha Kappa Alpha Sorority, Inc. led the way on the 3rd Annual Health Summit held at the Jackie Robinson Center. The event was FREE and focused on the complete person’s health – physical, mental and nutritional. There were over 400 adults and children that braved the heat and came out to the event to take advantage of the FREE testings, screenings, information and speakers. They patiently waited to get their eyes and ears checked, get their fingers pricked and get questions answered. While they waited, they enjoyed the sounds of 92.3 The Beat. The over 100 kids in attendance enjoyed Kid Zone, learned about the importance of fitness, learned how to use the Wii Fitness, had their eyes and ears tested and their mouths checked for early signs of cavities. Because so many diseases impact the Black and Latino communities at alarming rates, this event provided services and education to the community that helps to identify and prevent harmful diseases. The Speaker Series was kicked off by Dr. Juanita Watts from Kaiser Permanente. She talked about the devastating impact of diseases like cancer, AIDs, heart disease, diabetes, etc. on our community and the importance of taking preventative measures – now! She discussed that these diseases have such a negative impact on our community because of a lack of access to early testing and treatment due to lack of money, knowledge and fear. She told those in attendance that is important to take advantage of events like the Health Summit to get tested, gather information and ask questions. Other topics covered during the Speaker Series were ‘Knowing Your Status’, ‘Life Balance Strategies’, ‘Sickle Cell Disease and You’, a ‘Breast Care Demonstration’, and ‘Long Term Care – Facing a Growing Reality’. The feedback from those that attended the event was positive and they were thankful and grateful that the event was brought to them in their community. They were grateful for the information, the Welcome Package, tests/ screenings and raffle prizes. Many waited until the end of the day in hopes of winning the grand prize raffle of a Wii Fit that was donated by the Pasadena Chapter of Delta Sigma Theta. Because addressing the health issues of our community is of such great importance, the 2010 Health Summit is a collaborative effort of many organizations, businesses and political officials in the community. The sponsors for the event are the Pasadena Chapter of Alpha Kappa Alpha Sorority, Inc., AIDS Service Center, Gilead Sciences, City of Hope, D’Veal Family and Youth Services, and the City of Pasadena Department of Public Health. Alpha Kappa Alpha’s Eta Lambda Omega Chapter (ELO) has started off the New Year by helping some of our coldest community members keep warm this winter. The local sorority chapter held its annual coat drive marking the kick-off of to a year of service oriented programming for the Altadena/Pasadena area. The coats and blankets were given directly to those in need at Union Station Homeless Services Center. The event was organized by Union Station Committee Chair Ericka M. Smith and Co-Chair Pam Hughes. The annual coat drive is one of three donation drives ELO sponsors to help support Union Station. ELO also holds a blanket drive each February and a complete lunch is provided for more than 100 residents each November. Throughout the year ELO also sponsors many events and programs throughout the local area including a scholarship workshop, scholarship awards to graduating seniors, elementary science and literacy programs in addition to raising money for cancer and HIV/AIDS services and research. ELO is also a strong supporter of local businesses. with a Lifetime Achievement Award for his commendable service to their chapter. doing a brief step show. Everyone then packed the floor doing the Cupid Shuffle. look forward to you making an even bigger difference over the next 50 years!